The main home page for Google's Art Project. Every time you visit or refresh the page, the image presented changes to a different work of art. There is also a little square magnifying glass that you can use to closely examine the details and textures of the piece. Google is a massive empire of online services known for being the undisputed ruler of search. The publicly traded and quirky company always finds a creative way to present its latest endeavor. This time, it has to do with art. 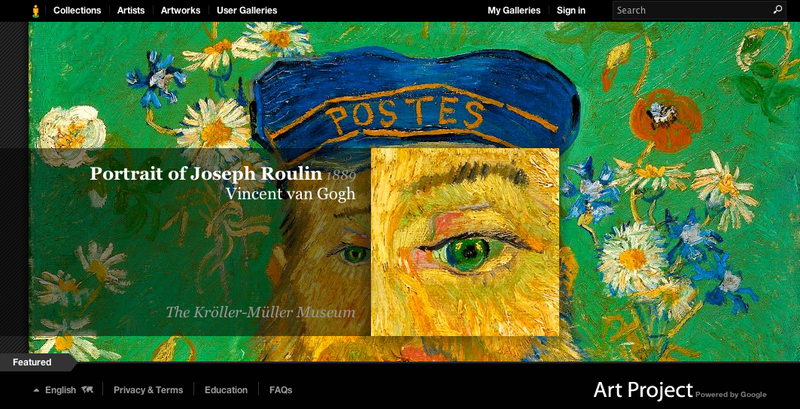 With cooperation and coordination with over 151 different art museums and collection houses, the search giant has introduced an upgraded version what might be considered the ultimate online worldwide art museum known as Art Project. Originally launched in February 2011, Google reacquainted the world with how this digital visual gallery displays artwork from all across the globe. Should you be worried about the price of admission? It’s free to access, so thankfully there are no fees to hassle with. However, not everything from a museum is completely online. As you roam around, you’ll notice some work will be blurred out and some sections will be inaccessible. Google’s reason for the blurred content is due to the copyright restrictions the museum or gallery need to enforce for certain work. But it was not Google who decided what went up online. They left the curatorial direction up to the museum partners to choose what they wanted to display to the online world. The navigation could be refined. For instance, you can’t instantly snap back to places you last left off when you press the back button in your web browser. It would also be helpful if there was a back, forward, mark for later, home button available with a snappy response similar to when you are moving around on an iPad. It may make some wonder if Google is considering or even developing an Art Project app for the iPhone or iPad. Heck, why not throw in the option to send donations to the museum of your choice that you can support? I am glad though that Google chose to present Art Project in high quality HTML code vs. the buggy and rather annoying Flash plugin from Adobe. While there is no official mobile app, you do have option to create your own galleries by adding portraits and work that you like and even writing comments (let’s call these notes) and share them with friends and family (thank you, Google+). This free buffet of beautiful art will definitely prove useful to art students and teachers alike. I was filled with excitement when I thought I had the chance to revisit the Louvre (I was fortunate enough to visit that famous museum in summer 2002 during a school trip to France, and loved it). Sadly, it was not listed. According to the Los Angeles Times, Google got in trouble in France in 2009 when a French court ruled that it was illegal for the company continue scanning copyrighted books in that country. The French are of course very protective of their culture and many institutions, so this explains partially why the Louvre is holding out. But the head of Google Art Project (grr…..need to find out his name) did note they are talking to the Louvre to possibly add some of their content in the future. Fear not, though, not all French culture is off limits. You can roam the Palace Versailles and the Musee d’Orsay, two equally beautiful and important cultural institutions in France (I actually liked the Musee d’Orsay the better then the Louvre due to its more manageable navigation and less overwhelming pressure to see it all). And then, with a swipe and a click, you can instantly transport yourself to another museum, like the White House. The Obamas might not be there to greet you though. Art Project is now of one the most accessible resources available for people to experience art when it may not be possible for them to personally travel to that far remote location themselves. Still, you should see art in person if you get the chance, since it can’t be caged online completely. There is a special, almost unexplainable experience when you walk into a gallery full of art. Go ahead, look, and the energy locked inside an artist’s work will have an effect on you. Remember not to touch it though, you don’t want the oils from your finger to ruin the composition and integrity. And, let us know what discoveries you make during your exploration.